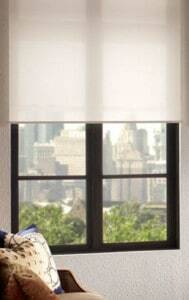 Ruffell & Brown is pleased to offer state-of-the-art battery motorization for window shades. Introducing QMotion™.The revolutionary innovation behind QMotion™ Shades offers industry-leading battery life, unbelievable quietness and effortless installation. 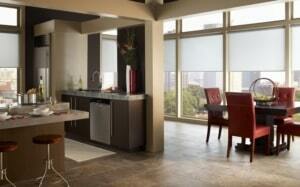 Finally, the luxury and safety of motorized shades, completely free of cords and wires, are accessible to everyone. And with a five-year warranty, you can rest assured we stand behind our powerful engineering. Imagine every shade in your home quietly rising and lowering on cue. Imagine the simplicity of no wires, and the beauty and safety of no cords. Imagine the flexibility of programming shades to move in groups at intervals of your choosing. Think it sounds like wishful thinking? Think again. QMotion™ from Ruffell & Brown, offers unprecedented innovation, beauty and simplicity. And for the first time in the industry, QMotion™ makes the luxury of home automation affordable. 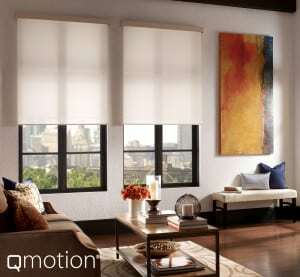 QMotion™ engineers have thrown out the rules and completely revolutionized the operation of motorized shades. Through the use of four high-precision steel ball bearings, QMotion shades from Ruffell & Brown, dramatically reduces the friction that exists when shades move. Less resistance means effortless motion, resulting in incredible battery life of up to five years – and a level of quietness never before available in a motorized, wireless shade.Standard alkaline D batteries are hidden from view inside the shade tube, yet are easily accessible when new batteries are required. And yes, batteries are included. Now that’s innovation. QMotion™ Shades from Ruffell & Brown are operated with a user-friendly, wireless remote control, which may be stored conveniently in a wall plate. But QMotion also offers the flexibility of manual operation. A short tug to the bottom bar of the shade activates the motor, causing the shade to glide to a fully open or preprogrammed intermediate position. Want more privacy? Simply pull the shade downward to your desired position. PEACE OF MIND. NO STRINGS ATTACHED. The cords used for traditional blinds and shades can pose a serious risk to children. With QMotion™ innovation, the beauty and safety of cordless motorization is finally accessible to everyone. Because we believe safety should never be a luxury item. Installing QMotion™ Shades is simple – no wires to run, no special tools required and no hard-to-find proprietary batteries. QMotion Shades are also unbelievably easy to use. Our shades can actually “learn” the height of your window with one easy step. Once learned, the shade will automatically generate preset open positions. Just use your remote to adjust to your preferred position, or manually adjust to any height by pulling the bottom bar. An option to preprogram the raising and lowering of the shades at preset times throughout the day adds an even greater level of simplicity – while helping to reduce home energy consumption. With QMotion, it’s never been simpler to take control over light and privacy. Why QMotion from Ruffell & Brown? QMotion batteries last up to 5 years based on 4 movements per day. Others make no claims. Best estimates are 6 months to 1 year. Compared to other battery-powered shades, QMotion is extremely quiet. Others do not have a manual motorized function. QMotion batteries are stored within the shade tube and are not visible. 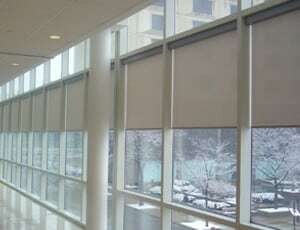 QMotion shades are easily programmed to move at desired intervals.